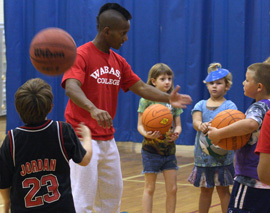 A program originally designed for girls has been modeled now for boys and held on the Wabash Campus July 20-24. Inner-City Chicago youth entering their sophomore year were on campus to participate in the STEP UP Project Coach Program. 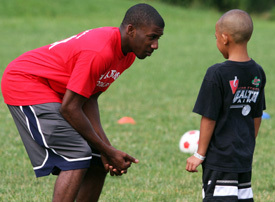 The program seeks to provide young men with an opportunity to explore their talents and interests related to coaching, while learning about College life. Dean of Students Michael Raters headed up the week-long residential camp with staff from Smith College, where the program was founded, and a couple of Wabash student volunteers. The 10 Chicago boys lived on campus and had a wide variety of experiences, including working most days with small children at the Montgomery County Boys and Girls Club. Mike Beemer, a long-time friend of the college, approached President Pat White about hosting the program. Smith trustee and foundation executive Linda Salisbury, who works out of Chicago, and Joe Sukup, an attorney and youth advocate in the Benton Harbor, Michigan area, proposed bringing inner city, high school sophomores from those two areas to Wabash. Jerry Bowie, Center for Academic Enrichment, has helped with logistics while Brock Graham ’09 has assisted with the student coaches and overseeing the living unit. The day time activities with the young children at the Club were just a small portion of the project. 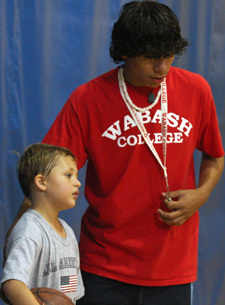 The Chicago youth also had the opportunity to work with Wabash coaches, admissions, career services and financial aid personnel. The goal is to set them up for their future which hopefully now includes college plans, Raters said.